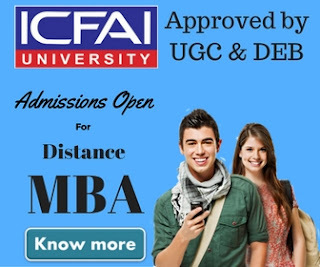 In our last post we'd discussed about various distance education MBA courses offered by Madras University, there eligibility, admission procedure & fee structure. 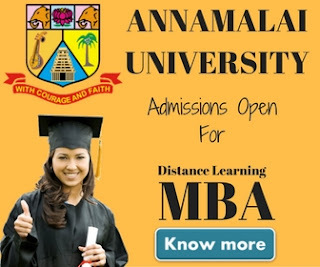 Today we'll post about University of Madras Distance Learning Executive MBA course syllabus, admission, fee, eligibility criteria & contact number. As we know Madras University is one of the oldest university in south India & runs various under graduate & post graduate programs but very few of us know that it also offer a special MBA program for experienced working professional called Executive MBA. According to wikipedia: Executive MBA (EMBA) programs developed to meet the educational needs of managers and executives. As we mentioned earlier Executive MBA from Madras University is a specialized program for working professionals, a 3 years of working experience is mandate to join this program. Semester 3 & 4 doesn't have any subject, candidate has to go through a project work followed by viva-vice. Minimum 50% marks is needed to pass to any any subject. Candidate has to pay a total fee of Rs.25,000/- for first year in which IDE share is Rs.15,000/- & Study Center share is Rs.10,000/-. In Second year candidate has to pay a total fee of Rs.5,000/- in which IDE share is Rs.3,000/- & Study Center share is Rs.2,000/-. Fees may be paid by means of challan through any one of the branches of the designated Banks. In places where there is no designated Banks, the students may make the payment by Demand Draft (Nationalised / Scheduled Bank) drawn in favour of “The Director, IDE, University of Madras”, payable at Chennai. Postal Orders, Money Orders, Mail Transfers and cash payments will not be accepted. Students admitted through Study Centres are advised to submit the Bank payment endorsed Challan by the designated Bank to the Study Centre for onward transmission to the Director and for collecting the learning materials from the Study Centre. Fees once remitted will not be refunded or adjusted in any manner under any circumstances. Fees Payable to Institute of Education, University of Madras: To be paid in the form of Demand Draft or Challan in favour of “The Director, Institute of Distance Education, University of Madras” payable at Chennai. Fees Payable to the Study Centre / Participatory Institutions : To be paid in the form of Demand Draft in favour of The Co-ordinator, Respective Study Centre / Participatory Institution. for more details about University of Madras Distance Learning Executive MBA admission procedure & fee details kindly download the prospectus.